Although I’ve always been fond of superhero comic books, I must admit that I’ve not kept up on them for quite some time. My heyday occurred in the early to mid Eighties. Though I’ve experienced a few resurgences of interest - primarily when I became reinfatuated with Batman after I saw the hit 1989 film - it’s been a while since I’ve actively checked out the adventures of my favorites. Because of this, I felt somewhat confused when I saw the title of Batman Beyond: Return of the Joker. “Beyond”? Beyond what? Beyond Bruce Wayne, I guess. The film doesn’t provide any spoon-fed exposition - a fact for which I’m grateful - but it’s easy to pick up on what has happened. The story takes place during an unstated future in which Bruce Wayne (voiced by Kevin Conroy) is an old man and has long hung up the cowl. For a variety of reasons not dissimilar to those that caused Wayne to go Bat, teen Terry McGinnis (Will Friedle) takes on the gig with Bruce as his mentor. From what I can tell, Terry’s been batting it up for a while when the plot thickens. As the film’s title clearly implies, a certain legendary nemesis from Wayne’s past seems to return. What’s up with that? Watch the movie to discover. As a long-time Batfan, I must acknowledge I initially found it hard to accept the changes. On the positive side, I liked the way the Beyond series integrates the old and the new. It keeps Bruce Wayne as an important influence but it lets McGinnis become his own Batman without too many constraints. This allows for additional variety to the escapades that couldn’t have been found in the adventures of the much-darker Dark Knight. However, my main concern stems from the fact that without the angst and creepiness of the original Batman, the character becomes less distinct. Frankly, McGinnis reminded me an awful lot of Spiderman. Lest we forget, Peter Parker became a crime-fighter for reasons similar to those that influences Wayne and McGinnis: the death of a relative. The main difference is that Parker received physical gifts due to unusual events (the bite of a radioactive spider), whereas Wayne and McGinnis have no inherent physiological advantages; they’re just regular Joes, albeit Joes who are buffed up, smarter than most, and have tons of money at their disposal. Anyway, McGinnis resembles Parker in that he’s young - Pete was still a high school student when he donned the webs - and he’s also glib. McGinnis makes for a much chattier and more engaging persona than did Wayne. 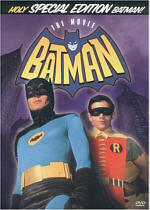 This seems fine in and of itself, but it definitely eliminates a lot of the distinctiveness associated with Batman. As such, the character simply feels less special in Batman Beyond. Granted, this was likely a “damned if you do, damned if you don’t” deal; had the new Batman been darker, he would have been accused of being nothing more than a cheap retread. At least McGinnis shows an attempt to alter the story, and within that area, Beyond seems fairly successful. Does it look like the series can ever approach the heights of the original? Probably not, but it appears pretty entertaining nonetheless. Joker presented a nicely engaging and exciting tale. I wouldn’t place it in a league with the better Batman stories of the past, but the plot moves along at a good pace and most of the story twists aren’t telegraphed too badly. Yeah, it’s fairly easy to figure out where things are going after a while - even with my lack of familiarity with the Beyond universe - but the tale is executed well and it kept me engaged. Perhaps the best sign that Joker offered a good telling of a Batman story stems from the fact it got me juiced to dig out some old comics. That means there must be something compelling about it. Bad movies don’t make me want to experience more from the genre, but Joker got me stoked to pick up some mags and get reacquainted with Bats and all the others. While I can’t claim that it’s stellar Batman, I enjoyed the movie and think it’ll offer an engaging experience for fans. These changes might not have been a big deal except for one problem: some screener tapes of the original version got out to retailers and journalists before the decision to change the film was made. That meant lots of people actually saw what they were missing, and those folks do not appear pleased by the alterations. I never got to watch the unedited edition, so I can’t say for a fact the movie would have worked better with them included. However, from what I’ve read, I think they would have made the film more powerful and compelling. As it stands, I enjoyed the current edition of Joker but I must agree with the displeasure of those who’ve bemoaned the edits. I won’t renounce the release version of the film, but any recommendation I make is less strong because of the alterations. By the way, some apparent evidence of the original cut made it to the DVD’s packaging. For one, the box indicates that the movie runs for 76 minutes, while the actual time is only 74 minutes. It also gives the film an “unrated” designation. That may have been the case no matter what, but I couldn’t help but think this was an artifact of the original’s more-violent tone. Batman Beyond: Return of the Joker appears in a fullscreen aspect ratio of 1.33:1 on this single-sided, single-layered DVD; because of those dimensions, the image has not been enhanced for 16X9 televisions. Question one: is this the film’s original aspect ratio? The DVD package states that it has been “reformatted” to fit the TV screen, but such information is not always correct; the case for Singin’ in the Rain says the same thing even though the aspect ratio matches the theatrical dimensions. Since Joker is a direct-to-video project, one can easily argue that 1.33:1 is the “original” ratio since it hasn’t been shown in any other dimensions. However, that doesn’t mean it was composed for that ratio. I saw no evidence of cramped composition, so my guess is that Joker shows an unmatted fullframe transfer; that would not crop anything, but it would alter the director’s original intentions. As a whole, the picture seemed quite strong. Sharpness was solid for the most part. A few wider shots came across as slightly soft and fuzzy, but these were rare; overall I found the image to look crisp and detailed. Some jagged edges and moiré effects complicated this appearance; neither appeared heavy, but they caused some distractions. Print flaws seemed completely absent; I detected no signs of scratches, grain, grit, speckles, tears or other defects. Colors looked wonderfully bold and vivid - they truly were a highlight of the movie. From rich blues to solid purples to accurate reds, the hues appeared marvelously rich and distinct. The tones appeared slightly too heavy during the nightclub shots, but otherwise they were excellent. Black levels were also tremendously deep and dense and they seemed nicely rendered. Shadow detail was appropriately opaque but not excessively dark. All in all, other than some jaggies and a little softness, Joker looked very good. Also good was the Dolby Digital 5.1 soundtrack of Batman Beyond. The soundfield seemed nicely engaging and aggressive. All five channels presented an active environment that always appeared clear and solid. The audio blended together naturally and it seemed to pan cleanly from speaker to speaker. The directional qualities were realistic and convincing, and they helped make the film more effective than it otherwise might have been. Audio quality seemed positive as well. Dialogue sounded crisp and distinct and lacked any signs of edginess or problems related to intelligibility. Music was bright and dynamic and showed nice range; while I didn’t always like the style of the score, it did come across accurately. Effects were clean and rich, with no evidence of distortion or harshness. Bass response seemed decent, though it could be somewhat weak at times. Music suffered the most, as the score showed heavy midrange but not much depth. Louder effects boasted a nice punch, but the rest of the track seemed somewhat anemic to a certain degree. Overall, I still liked the soundtrack for Joker, but it didn’t merit a grade higher than a “B”. Batman Beyond: Return of the Joker includes a bunch of supplements. First up is “A Word From the Creators”, a running audio commentary. In it we hear from producer Bruce Timm, producer/writer Paul Dini, producer Glen Murakami, and director Curt Geda; all four were recorded together in one session. Although the track can be somewhat dry at times, it provided a nice package of information about the making of the film and the series as a whole. We learn about alterations made to the movie during production and a variety of other issues. Unfortunately, they never touch upon the more violent edits I mentioned earlier; I’d guess the track was recorded before they occurred. Nonetheless, the commentary was generally entertaining and informational, though it did peter out somewhat during the second half. 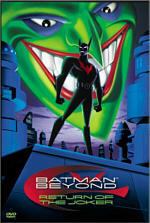 Next we get a featurette called Beyond Batman Beyond. The program lasts 11 minutes and 55 seconds and provides a general overview of the movie and the TV series. It’s presented at a fast pace, so the mix of interviews with filmmakers, voice talent and others plus film clips never gets very deep; the show stays fairly glib and superficial. Despite that, the piece was entertaining and moderately compelling. In Animatics, we find three minutes and 20 seconds of material. Animatics are filmed storyboards accompanied by music and speech; they’re used to give an early approximation of the film’s pacing and timing. The ones shown here are mildly interesting but nothing special; none of them display unused material for the movie, so they just repeat shots included in the final product. The Animated Biographies show listings for six different characters. We find entries for Bruce Wayne, Terry McGinnis, the Joker, the Dee-Dee Twins, and Woof. What we observe is running text with some graphics and animation plus background music. Despite the extra pizzazz, it remains a fairly static presentation. As a whole, the biographies offer a little primer for those who haven’t followed the “Batman Beyond” universe. However, don’t watch this four minute and 43 second piece if you haven’t already watched the movie; it reveals a lot of plot information. Listed on the menu under “Confidential Bat Footage - For Your Eyes Only”, the Deleted Scenes section actually offers only one segment, and it’s not even an animated piece. Instead, we find one segment presented through animatics. The program lasts for five minutes and 18 seconds and is moderately interesting. However, I didn’t think the extra material would have added much to the film. Bat-Trivia provides seven questions about the TV series but doesn’t address the movie. As such, I had trouble with it since I’ve not watched the show. However, the multiple-choice quiz is forgiving, so it doesn’t hurt you to answer many of them incorrectly. Next up is the music video for “Crash” from Mephisto Odyssey Featuring Static-X. It’s a stylish lip-synch party at the Batcave, with only a few movie clips stuck into it at times. As a whole, it’s an interesting video that isn’t great but it’s more fun than most. Lastly, we find trailers for Joker, the Batman Beyond Video Collection, The Iron Giant, My Dog Skip, Pokemon: The Movie 2000, and Scooby Doo and the Alien Invaders. In addition, we find a few DVD-ROM features. “Extra Extra” simply links to the WB “Online Events” page. “Gotham’s Most Wanted” offers links to a variety of Bat-related websites, while “Batty Sounds” shows the soundtrack album’s tunes and links to a place where you can buy it. The DVD also provides web links to a few other related sites. Yes, it’s a very blah collection of DVD-ROM pieces. Although I don’t think the world of Batman Beyond seems as compelling as the original Batman universe, I nonetheless found Return of the Joker to present a fairly engaging and entertaining experience. The movie expanded upon the legend and diversified it nicely through this acceptably exciting and deep adventure. I don’t like the fact the original cut of the film was edited prior to this release, but the current version works well nonetheless. Picture and sound both seemed very good, and the DVD includes some decent extras. Bat-fans should give Batman Beyond: Return of the Joker a look. Update: the review above reflects the original DVD release from December 2000. 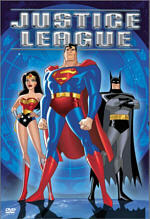 Warner Bros. finally decided to give the fans what they want and put out the unedited edition in April 2002. A review of that disc can be found here. 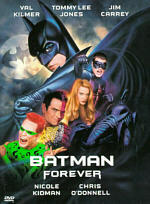 To rate this film go to BATMAN BEYOND: RETURN OF THE JOKER - UNCUT VERSION.